Published: Dec. 15, 2018 at 06:01 p.m. Published: Dec. 9, 2018 at 06:21 p.m. 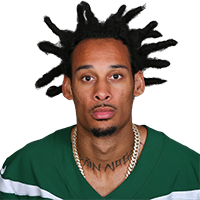 Published: Oct. 7, 2018 at 05:36 p.m.
New York Jets quarterback Sam Darnold coasts a throw to New York Jets wide receiver Robby Anderson for a 76-yard touchdown against the Denver Broncos for Week 5 of the 2018 season.